Recently I had the privilege of interviewing the amazing Michael Price, the Executive Producer and Head Writer of the upcoming LEGO Star Wars series Droid Tales. 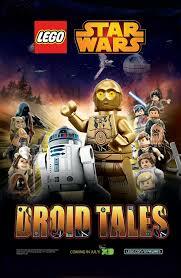 In addition to Droid Tales Price has written the standalone LEGO Star Wars shows The Padawan Menace and The Empire Strikes Out; he was also the Head Writer on the hit LEGO Star Wars series The Yoda Chronicles. For those who are familiar with the world of LEGO Star Wars you will know that the level of humor is unprecedented, and the combination of comedy and the classic Star Wars feel is fantastic, bringing the most iconic moments from the films to life in LEGO. I’m a huge fan of these shows and feel incredibly lucky to have been able to chat to the mastermind behind them, so without further ado here is my Q&A with Michael Price where we even talk about the upcoming Droid Tales! Q: Being a Star Wars fan how does it feel contributing to part of an ongoing legacy in such a fun and enjoyable way? Q: How is it to work with the fantastic Anthony Daniels as Threepio? Q: I was actually watching the panel live on You Tube, I loved the way you bought Daniels on stage to finish the lines missing from the Droid Tales sequence you showed! Q: How closely do you work with your partners at Lucasfilm when creating a new TV show? Q: Who is your favourite character to write into the shows and why? Q: Couldn’t agree more. He’s such a fantastic character. A: “Yeah he’s super fun to write into the shows. We really wanted to incorporate and have fun with his double life. I mean, it must have been incredibly stressful for him, pretending to be one person but really wanting to be someone else. His relationship with Vader is also funny to me; he’s very much like the angry father with Vader being his son who can never do anything right. Then we have Grievous and Palpatine’s relationship where he also can’t do anything right! We have a lot of fun incorporating the kidnapping of Palpatine (from Revenge Of The Sith) into Droid Tales seeing the actual moment of the kidnapping and having more fun with the Grievous/Palpatine comedy team. I think people are really going to like it. Also I want to give a shout out to Trevor Devall, who voices Palpatine, and Kirby Morrow, who voices Grievous. They’re both super talented and great to work with”. Q: Did you find yourself writing characters into Droid Tales differently then you previously had into say, The Yoda Chronicles? Q: We all know the LEGO Star Wars series and standalones are not canon. However, would you say you have a canon within your LEGO stories? Could we see Jek-14 show up in Droid Tales? Q: So we won’t be seeing Rusty or Jek in Droid Tales then? Q: Poor Rusty. Well, at least I remembered him! Q: I’m a huge LEGO Star Wars collector so I can really relate to the shows. Are you a collector at all? Q: Nice! Well I for one can’t wait for Droid Tales and to see what you’ve created for us! Q: That’s great. I’m really excited for it and thank you for everything you have done so far. I really hope you carry on writing LEGO Star Wars far into the future! And thank you for your time Michael, its been great to chat! I’d like to say another thank you to Michael Price for taking the time out to speak with me, and to Amanda Santoro of the LEGO Group for arranging the interview.